2-Light Bathroom Light with Mosaic Glass in Satin Nickel Satin nickel 2-light bathroom light with oblong shaped mosaic glass. The tiles on the mosaic shades are made of a natural product which can lead to variations in color. This bathroom light takes two 100-watt maximum rated medium base A19 frosted light bulbs (not included). Suitable for installation in dry and damp locations. It can be mounted with shades facing up or down. 120 line voltage. UL and CUL rated. 7.5 in x 16.88 in x 6.5 in x 16.88 in. 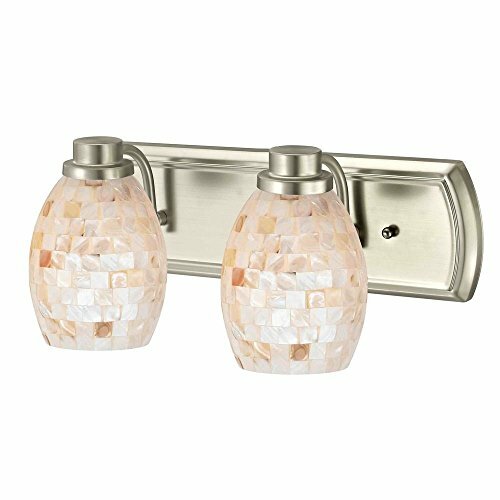 Design Classics 2-Light Bath Light w/ Mosaic Glass in Satin Nickel - Steel Wall Fixture - 7.5 in X 16.88 in X 6.5 in X 16.88 In.